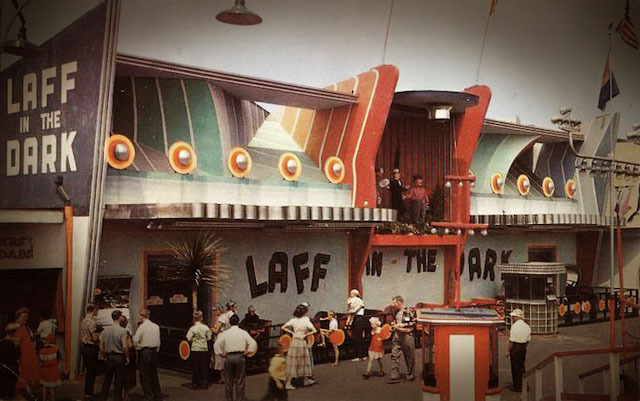 “Laff in the Dark” featured the well-known Laffing Sal, but there was a minor character that would soon become famous. Hanging from the gallows was a dummy painted with bright orange phosphorescent paint. Many would miss it if it weren’t illuminated by a blue light in the corner. The dummy was purchased years ago from a man named Spoony Singh, who is most famous for starting the Hollywood Wax Museum. The dummy had once been on display at the museum. 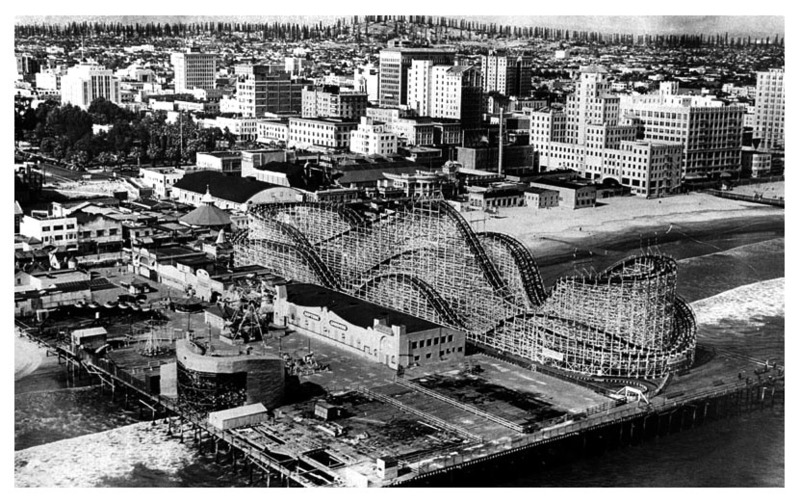 In fact, it had also been on display at an attraction at Mount Rushmore and before that, carnivals around the country. But it was at Mount Rushmore that the dummy sustained damage. A wind-storm blew down the attraction and many of the dummy’s fingers, toes and part of its ears fell off. When it was returned to Spoony, he determined the dummy was “too gruesome” to display in his museum and sold it to The Pike. The Pike was often used by film and television studios as a filming location. Shows like Charlie’s Angels and Starsky and Hutch had episodes filmed at various locations around The Pike. In 1976, The Six Million Dollar Man was scheduled to film the episode “Carnival of Spies” at the amusement park. “Laff in the Dark” was going to be one of the set locations. Before filming could begin, a prop man surveyed the location and began to move things around. He thought it best to remove the orange wax dummy from the gallows; it just didn’t go with the scene and it might’ve been a bit too morbid for television. As the dummy was being removed, the arm fell off, just at the elbow. The dummy looked like it had broken before. In fact, the arm had broken off during that wind-storm at Mount Rushmore. Upon closer look, the prop man noticed that there was bone protruding from the broken elbow and tissue that looked more humanly than wax. The police were immediately called and the dummy was taken to the LA county coroner’s office where an autopsy was performed. Turns out, it was bone and human flesh. The dummy was actually a human man, mummified and covered in wax and paint. The coroner determined he had died from a gunshot wound to the chest. Once the shock of this morbid discovery wore off, law enforcement and the coroner had one question to ask: who was he? No one at The Pike knew. However, the corpse had a few more stories to tell. Inside the mouth was a 1924 penny and ticket stubs to the 140 W. Pike, Side Show and Louis Sonney’s Museum of Crime. Louis Sonney’s son was contacted and he knew exactly who the body belonged to. 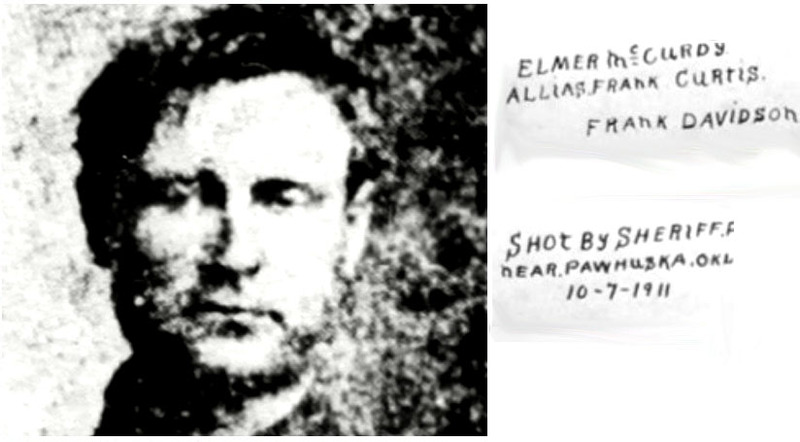 It was Elmer McCurdy, a bank and train robber, who died at the age of 31 during a shootout with police. He was born on January 1, 1880 to an unwed mother, who gave him up to be raised by her brother and his wife. McCurdy’s mother Sadie would later tell him that she was his real mother, but that she wasn’t sure who his father was. It’s been suspected that Sadie’s own cousin was the father. The news of his lineage infuriated McCurdy and he went on a downhill spiral from there. He drank heavily in his teens and adulthood and was arrested for public intoxication. He began his life of robbing trains and banks in 1911, the same year he would die. On October 4, 1911 near Okesa, Oklahoma, McCurdy would rob his last train. 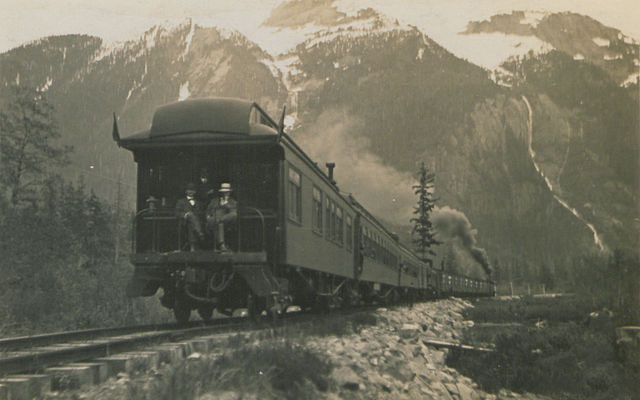 The robbery would later be regarded as “one of the smallest in the history of train robbery.” McCurdy only made off with $46 and items he took from passengers, including whiskey and a revolver. A posse was assembled to bring McCurdy to justice. Drunk from the whiskey he stole, McCurdy fell asleep in a hay shed, unaware that the posse was surrounding him. On October 7th at around 7 am, a shootout started and lasted for about an hour before McCurdy was shot and killed. 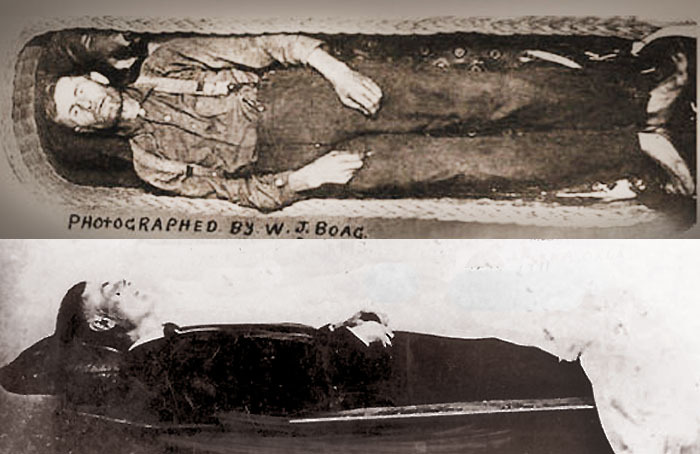 Elmer McCurdy’s body on display at the mortuary. No one claimed McCurdy’s body. The mortician at the funeral home refused to bury the body until he received payment for his services. After McCurdy’s body had sat in a backroom for sometime, the undertaker decided to make some money off the body and began charging people 5 cents to see the “The Bandit Who Wouldn’t Give Up.” The body caught the attention of carnival owners, who offered to buy the body, but the undertaker refused. 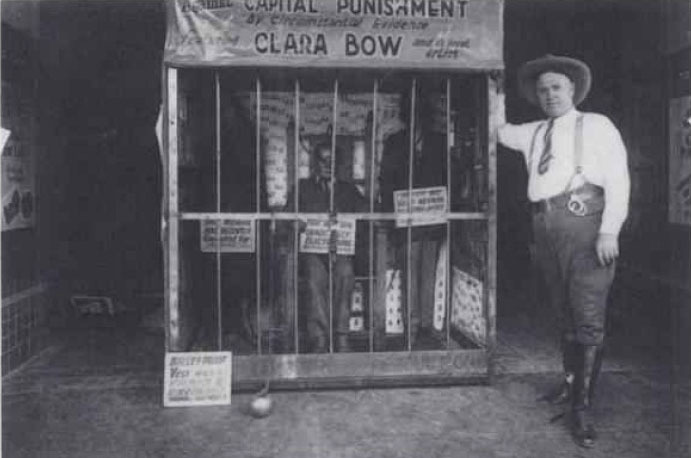 Louis Sonney standing near an exhibit for the Museum of Crime. McCurdy’s body was featured in an exhibit as a dope fiend who shot himself when surrounded by police. By this time, McCurdy’s body had shriveled, which added to the illusion that his corpse belonged to a heavy drug user. 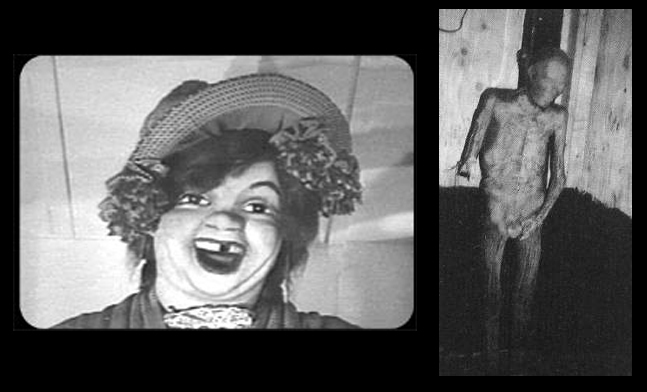 After Sonney’s death, McCurdy’s body was put in storage for nearly 15 years until it was removed and used in the film She Freak. McCurdy’s body was then sold to Spoony Singh, who you may remember from the beginning of this story. A forensic anthropologist was called in to confirm McCurdy’s identity. It was him. On April 22, 1977, a graveside service was held for Elmer McCurdy over 65 years after his death. He was buried in Guthrie, Oklahoma with over 300 people in attendance. Concrete was poured over his coffin to ensure that no one would steal his body again.